I finished this table runner (at least I think so) and I am so happy. It was from some leftover flying geese which I made for another quilt. 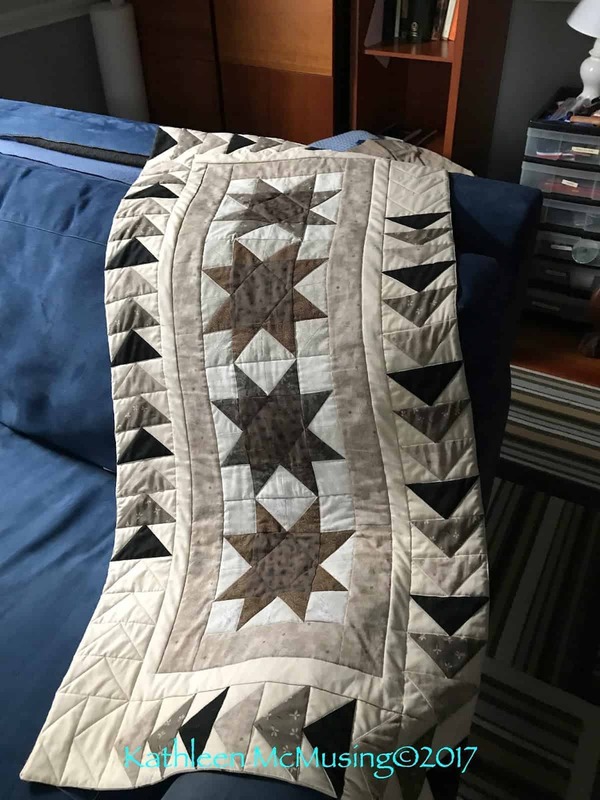 Like most of the time, I quilted this on my Bernina 440QE. I mostly used my walking foot but also my ruler foot for a very small piece. As I worked, I found it was easier to do each side of a “goose” rather than twist around each one. Here’s a picture of the back. I am finding more and more I love my “in the ditch” quilting foot. Its a new plate for my Bernina 440Q walking foot. 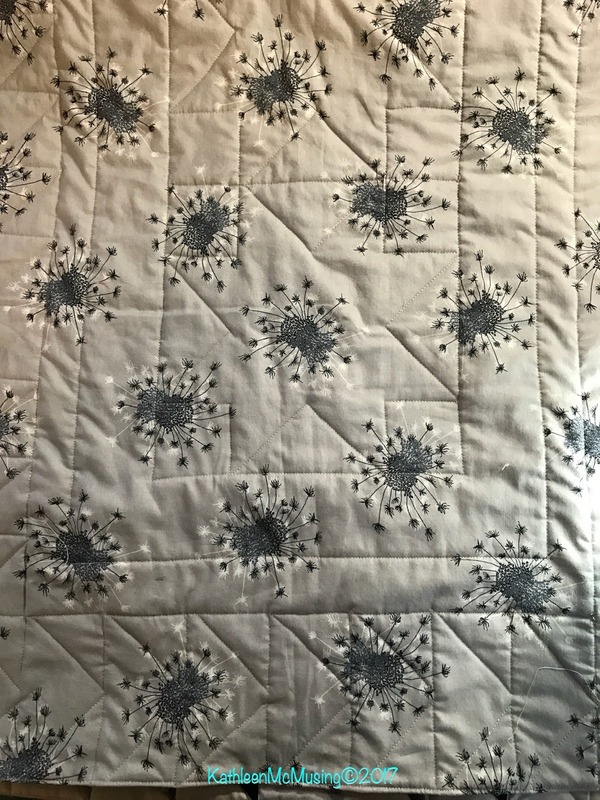 Also, it made it easy to go around the edge of the quilt with stitches by moving the needle a few “dots” either left or right of center. But I still wanted to do some ruler work on the inside of the stars. It was so much easier than marking it! I’m glad I did it. Speaking of marking, I wasn’t sure about doing the shadow geese in the solid fabric, but I finally did it and am glad that I did. I think it help completes the table runner. This pattern was adapted from “Elegant Runner” by Terry Albers in Fons & Porter’s Easy Quilts, Fall 2012. I saved it knowing I had these flying geese to use up. Another UFO finished for 2017! 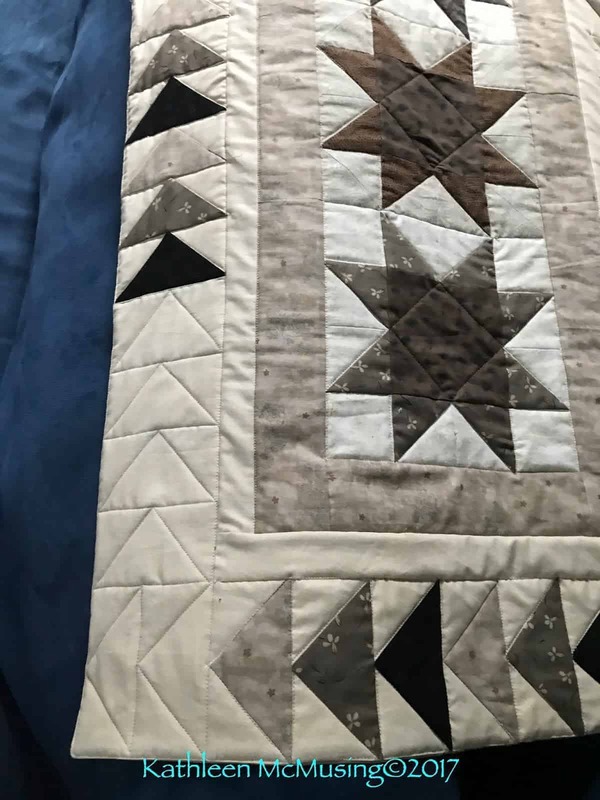 Great use of scraps and I agree that quilting the shadow geese was a lovely quilting decision. Thanks, Yvonne. I think it was the right thing to do.